All books contain instructions, as well as dozens of beautiful full size patterns for you to woodburn. Each book has 8 pages of full color and varies from 50 to 96 pages in total length. 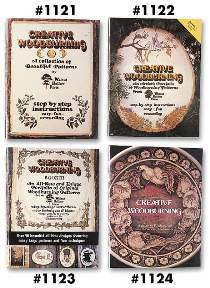 Books 1-3 are for beginner to intermediate woodburners and Book 4 contains larger and more advanced projects.